What is Public Art is SmART? Norman Arts Council’s Public Art is SmART (PAIS) program uses Norman’s public art as the catalyst for dynamic educational resources created to encourage educators of every grade level and subject area to enhance their teaching and students’ educational experiences using various, wonderful pieces of accessible works of art. Public Art – What is it? Public art enhances Norman’s landscape. What are the benefits? Public art visually benefits everyone and can positively affect tourism, economic development, and our quality of life. Since it is free to enjoy and is easily accessible to all, it can be a lively springboard for dialogue and education. Norman’s public art: Our collection of public art is in all parts of Norman and includes a variety of mediums, subjects, and styles. Click here to connect with Museums Without Walls for information about all our works of public art including an interactive map. Prezi is a dynamic way to present information. Our resources are primarily based on a Prezi format. You can either teach directly from them or peruse them for lessons or inspiration. Follow the path or click to zoom into parts that interest you. Lesson Ideas (2 ideas per subject) – Art, Social Studies, Language Arts, Math, Science, Misc. We create unique lessons based on the subject, location, appearance, medium, and symbolism of each piece of public art. In our lessons, we also connect you to educational interactive resources. These are perfect for iPads, Smartboard activities or use in media centers or computer labs. Each resource contains a list of picture and chapter books that are appropriate for a variety of grades and reading levels. For example, geometry. The Geometry of Quilts is a lesson from the Horses in Motion resource that relates to piecing together triangles to create a quilt pattern. Begin with Horses in Motion and teach about the bridge, the artist, and the symbolism of the enhancements. The expansive length of Rock Creek Road Bridge, 431 feet, affords a unique opportunity to show representations of the City of Norman’s industries in breeding quarter horses and crafting saddles highlighted by Native American design influences. This bridge was the first of an eight bridge master plan developed specifically for the I-35 Corridor in Norman, Oklahoma with each one inspired by either the history, architectural, flora or fauna, or the industry of this region. Copyright 2018 Creative Design Resolutions, Inc. 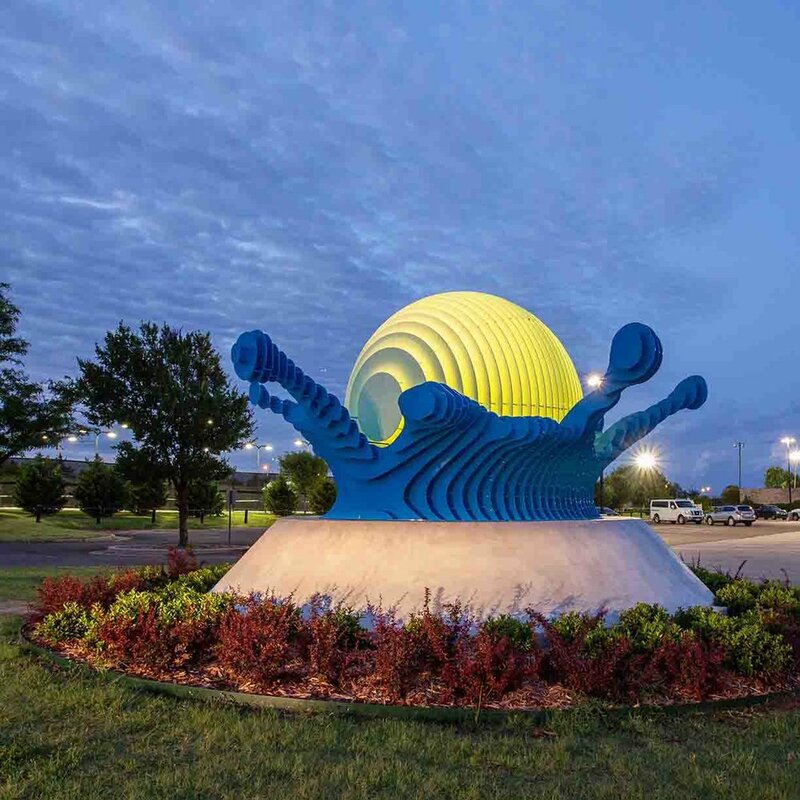 The first public art piece made possible by the Norman Forward 1% for Art Program — Splash by Mark Aeling — was installed in late 2017. It welcomes visitors to the Westwood Family Aquatic Center, the renovated swim complex and waterpark adjacent to public golf and tennis facilities, inspiring Aeling’s playful, colorful design of a tennis ball splashing into the water. Curriculum developed around Splash involves the changing states of liquid, animation, energy transference, figurative language, calculating your water footprint and much more! Our resources correlate standards in Visual Arts, Math, Language Arts, Science, and Social Studies. Many standards only change in the depth and breadth as grade levels progress. Generally, standard numbers are given where the base standard applies, although wording might be slightly different amongst grade levels. We want to provide you with the materials your students need for doing the activities included in our resources! You can order them from us and we will deliver them to you. Following each activity you will find a form to request materials for that project. This form includes the activity name, a list of the supplies so you can indicate which of those you need, number of students, to whom and where they should be delivered, by what date, and contact information for any questions. Complete the form, send it to Cher at the Norman Arts Council, and when she receives your request, she will send confirmation to you. We must have at least two weeks’ notice before the materials are needed. Please allow for holidays when planning for delivery of materials. You will receive a color 22 x 28” poster of the subject work of public art when you order materials for projects in our resources. Each of our resources includes a Related Books section. We have sets of each title at the Norman Arts Council that are available for you to borrow for a 1 month period of time. Call Cher at the NAC (405.360.1162) to check availability of the books and schedule when you would like to check them out. Availability is limited, so please plan accordingly. When we deliver your book order, we ask that you are prepared to schedule an appointment in 1 month for us to pick-up the books. We need your input! It is vital for the effectiveness of Public Art is SmART that we can properly assess its impact on teachers and students. In order to make certain that it is always beneficial for you and to enable us to qualify and quantify our results; we ask that you complete the program survey that you will find here. In that survey, you will find a place for you to tell us about any positive, meaningful stories related to the impact of our program on you, your students, or perhaps a member of a student’s family. Please take the time to relate those stories to us. We want to be able to continue to use Norman’s public art to help you and your students in the best possible manner. If you would like to complement your lessons by having a creative, teaching artist work with your students, the Norman Arts Council can help you find the right artist and Sudden Opportunity Support grants are available to provide help with the funding. If you have any technical difficulties or problems with our resources, we want to solve them as quickly as possible. Contact Norman Arts Council by phone (405.360.1162), email at publicartissmart@normanarts.org or fill out the form below. Please let us know if you have any additional comments at publicartissmart@normanarts.org or by filling out the form below.